The most common frustration that people have when using both Pipedrive and Mailchimp? It’s not automatic and only syncs one-way. 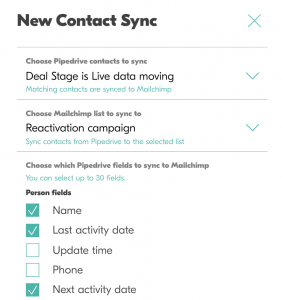 While Pipedrive’s native Mailchimp integration does make it easy for you to add Pipedrive contacts to Mailchimp, it involves manual work and the data about opens and clicks does not loop back to Pipedrive. It’s ‘stuck’ in Mailchimp. One of the things Outfunnel allows you to do is to “complete the loop” and make sure that your Pipedrive account is automatically updated when Mailchimp is (and vice versa). Make all Pipedrive contacts or subset(s) you define with filters available in a Mailchimp Audience along with your fields and custom fields. Keep the two databases in-sync going forward. Eg. if someone moves from Pipeline stage X to Y or a custom field is updated, this is recorded in Mailchimp automatically. When people open or click on email campaigns, this data will be recorded in Pipedrive Contacts and/or Deals. New Mailchimp subscribers can be copied to Pipedrive as Contacts. Alternatively, new contacts can be copied to Pipedrive only when they open or click on an email campaign. 1. Once you’ve signed up to an Outfunnel account and connected Pipedrive and Mailchimp as per on-screen instructions, go to Outfunnel > Automations and click on New automation. 2. Choose whether to sync all Pipedrive contacts or only contacts you’ve defined with a filter. Your Pipedrive filters will be visible if you click on the arrow down. As you are syncing contacts, not Deals, then only Pipedrive People filters are visible in Outfunnel. 4. Finally, select which fields or custom fields you’d like to sync to Mailchimp. You can choose up to 30 fields from all your Person and Organization fields and custom fields. It takes 2-5 minutes for your chosen Pipedrive contacts to appear in Mailchimp. Outfunnel creates these fields in Mailchimp automatically so you don’t need to pre-create them. 1. In the Outfunnel > Automations page, scroll down to Mailchimp to Pipedrive automations and click on New automation. 2. Choose whether you’d like to sync activity from all Mailchimp Audiences or a specific Mailchimp Audience only. 3. Finally, define how you’d like email activities like opens, clicks, bounces or unsubscribes recorded in Pipedrive – or simply use our default settings (which we’ve described below). You can change these settings at any time by clicking on the name of the automation, the three dots just right of the “Sync now” button and making the changes. That’s it! 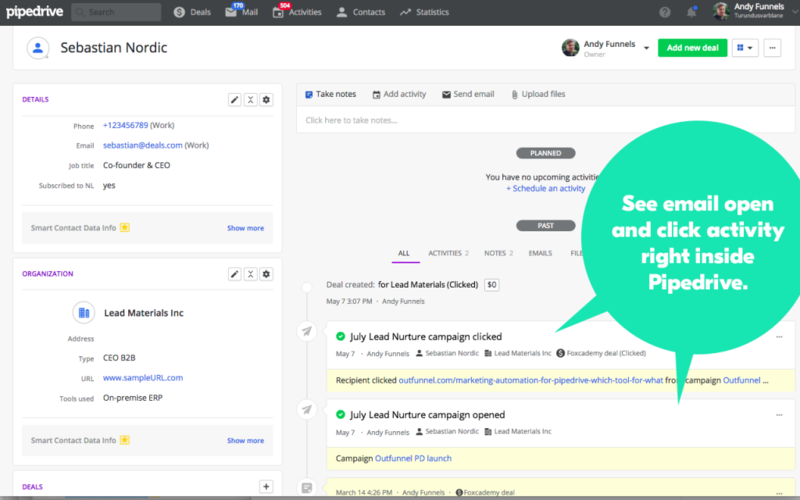 You’re ready to start sending email campaigns from Mailchimp and seeing activity reflected in Pipedrive. Option A. Master database of all contacts in Pipedrive, contacts synced to Mailchimp for emailing via Outfunnel. To enable this, first collate your whole contact list (Pipedrive + Mailchimp) into Pipedrive and sync the all contacts, or a selection you define with Pipedrive filters, into Mailchimp with Outfunnel. Option B. Contact list in Mailchimp is separate from prospect/customer list in Pipedrive. If a contact, defined by their email address, exists in both Pipedrive and Mailchimp, we log email engagement to Pipedrive to the right contact. If a contact who previously only existed in Mailchimp opens or clicks an email, Outfunnel can create a new Pipedrive record and a Deal. And you can also configure Outfunnel to create new Pipedrive contacts if people subscribe in Mailchimp. Best results with a new Audience. We recommend to set up a brand new Mailchimp Audience to ensure everything works flawlessly, but syncing data to an already existing Audience works as well in most cases. Sync frequency. Outfunnel syncs dome data instantly and some every 4 hours (approximately). You can force a sync when you click on the headline of an Automation and then click the “Sync events now” button. Email activity is registered on a Contact level as well as a (single) Deal level. If someone is sent an email, or they open or click an email, this is registered independently of the deal stage or pipeline in their Contact profile. This is also registered in a Deal in the pipeline you can define in the Mailchimp to Pipedrive Automation setup screen. New Deals will be created in the exact stage you define in the above screen, email activity will be recorded in the Deal view even if the Deal is currently in another stage in the same pipeline. Email activity can’t be reflected in multiple Deals at the same time. Single source of truth is Pipedrive. Outfunnel currently treats Pipedrive as the “single source of truth”, and any changes you make in Pipedrive will be reflected in Mailchimp. This doesn’t work the other way around. If you’d like to edit contents of a field in Mailchimp, please make the changes in Pipedrive and let Outfunnel take care of syncing this to Mailchimp. Make edits on the Pipedrive end only. Furthermore, making changes to fields or contents of fields that are synced via Outfunnel on the Mailchimp end may result in partially disabling Outfunnel automations. Supported field types. Outfunnel currently supports syncing the following field types: text, numbers, single selection answers, phone numbers, dates, addresses, monetary values. We don’t support multiple selection answers. Supported campaign types. Outfunnel comprehensively tracks and records data for Mailchimp’s Regular and Automation campaigns, also A/B tests. 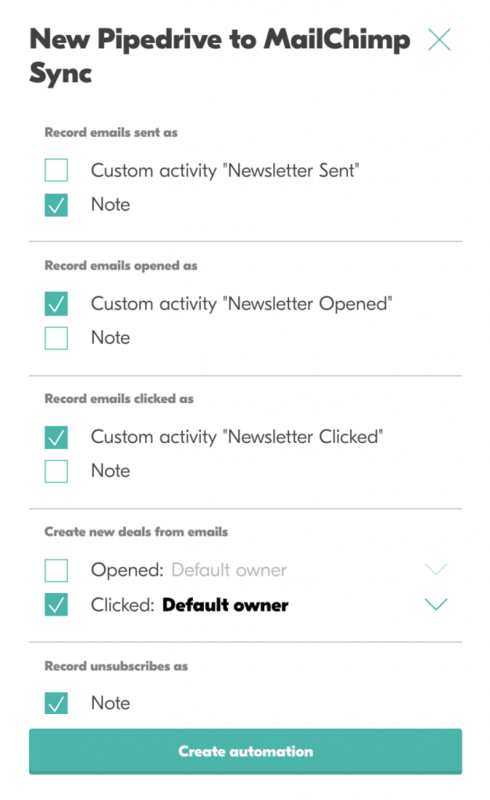 A custom activity “Newsletter clicked” and a new Deal is created for each email clicked. The new deal is created for Default owner ie. owner of that Person in Pipedrive. Unsubscribes are recorded as Notes. You can also choose a custom field to be updated upon unsubscribing. If you don’t want Outfunnel to create a new field for this, click on the drop-down arrow and choose any single-option Person field you want to be updated. If you are using multiple Mailchimp Audiences, Outfunnel can update the same Pipedrive field for all Audiences or a different field for each Audience. The latter is useful when you want to keep your users subscribed to other Audiences, but would also like to filter unsubscribed users in Pipedrive. Newsletter Bounces are recorded as a Note. You can also have them recorded as a “Newsletter Bounce” custom activity, or both. New Mailchimp subscribers are not copied to Pipedrive by default. If you’d like to activate this tick the “Create contacts from new subscribers” box at the end of the automation setup form. You can change these defaults and easily choose which Pipeline is used for creating new Deals and who the Owner of to-be-created deals is. Notifications. If you’d like to receive email notifications about people opening and/or clicking your newsletters, you’ll need to turn on Email notifications feature in Pipedrive. (See how). Once enabled, each user can turn on Email notifications by going to Settings > Personal > Preferences > Notifications. Finally, here’s a video that Pipedrive consultant Paul Minors has produced about Outfunnel. Want to learn how to get more of Outfunnel? Check out this post which describes the eight powerful automations you get with Outfunnel.